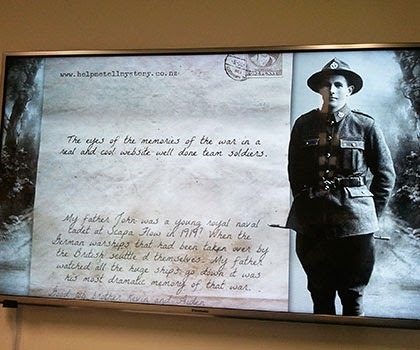 A collaborative multimedia exhibit revealing tales of home-grown war stories has inspired a new reciprocal relationship between Unitec and Auckland Libraries. The More than a War: Remembering 1914 – 1918 exhibition was produced during a series of workshops run by Auckland Libraries to commemorate the 100th anniversary of the First World War. It included a story of love and loss recreated from love letters from the war years, accounts of women working on the home front and the war efforts put in by Kiwi kids. Students were encouraged to use a variety of media to tell their stories, including audio-visual production, a digital touchscreen, video looping and blogging. The exhibition was produced as a labour of love by Unitec Communication programme Leader Dr Sara Donaghy and Libraries Oral Historian Sue Berman. The project was set as an assignment for the programme’s first- and second-year students, and encouraged them to make their own connections with what was happening in New Zealand during the war - miles away from the battlefields. Sara says they wanted the series of projects to focus on stories from the home front, teasing out forgotten pieces of history and cultivating cultural responses from her students. “We wanted to not just create awareness of World War One content, but to also bring a youthful dimension in reimagining and reinterpreting the war in a way that speaks closer to the students and their peers,” says Sara. Both Sue and Sara admit that when telling the students of their new venture they were met with some blank gazes, but the student's response steadily improved through a series of helpful workshops that offered insights into a few tricks of the trade in oral history. Students were challenged to use a range of different media to tell stories about New Zealand during the First World War and they responded by using applications such as a digital touchscreen, video looping and blogging. manuscripts, and images to create their stories. “It went from a project that wasn’t of much interest to the students to one that fuelled a highly engaged audience – which is in fact the best way students learn,” says Sara. Sue says the students’ work flourished into something quite unexpected, which delved beyond the death, glory and carnage of the front lines. “What we were really impressed about was the variety of focus, not just the stories of the soldiers or trenches,” says Sue. Among them was a remarkable tale, told by student Sam McLaren’s grandmother Noelene, of the two patriarchs in her life who fought on opposing sides during the war. The two men meet in New Zealand years later as old men and became allies over many whiskeys while rehashing memories of the war. In a Radio New Zealand National interview, Sam said it was a privilege to interview his grandmother as it strengthened the bond between them. “I also realise how lucky my generation is, so it’s really amazing how two enemies created this family, my family,” says Sam. Sue says she was impressed by the group of students who went out and conducted interviews themselves, contributing to the Auckland Libraries archive by creating some primary material. “As an oral historian I was really thrilled with those students that took that leap,” says Sue. Alternatively, a group of four students requested permission to use a photo of an unknown soldier to inspire their project. and asked visitors to help tell his story. 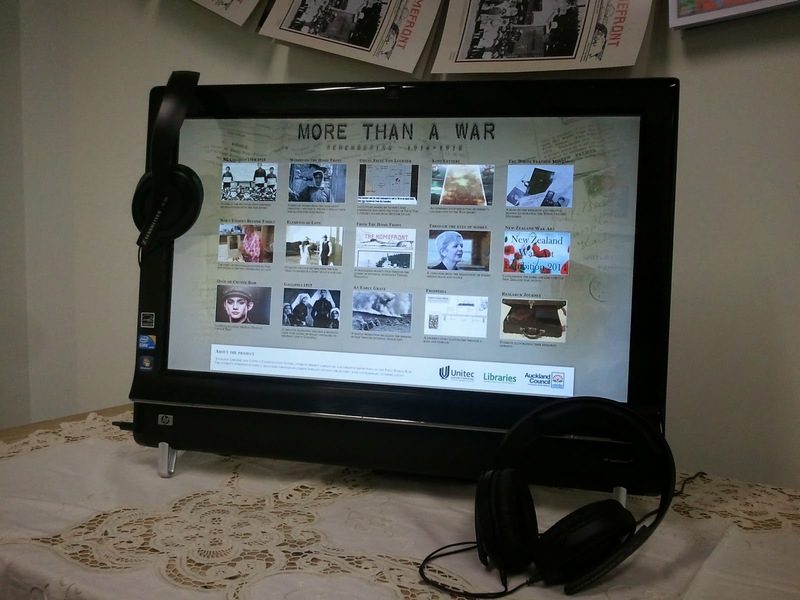 Visitors to the exhibition were able to participate via a touchscreen, by contributing stories of what the soldier’s life might have been like through a site called ‘Help me tell my story’. Their thoughts were projected onscreen at the exhibition each day via a live feed from the website. Auckland Libraries' role was to be a conduit for supporting these students in gathering comprehensive and quality archive material, providing assistance in oral history training, methodology research skills and access to useful databases. 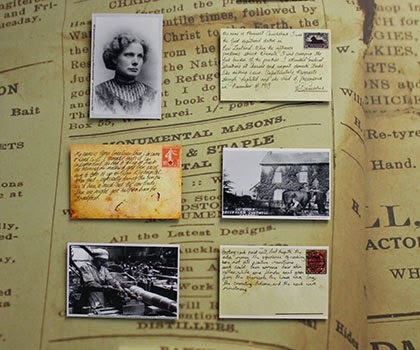 Sue also created her own oral history collection which has run parallel to the students’ exhibition, including six in-depth interviews with the children of First World War veterans about their war connections. These recordings can be found in the Auckland Libraries local history archive. Sara hopes to re-establish the works from the exhibition at Unitec once she is able to house the variety of mediums and technology used to display them. Unitec will shortly be taking up residence at Waitakere Central Library in Henderson as part of a new reciprocal relationship between the two institutions.